Sarama Resources (TSX-V: SWA) is a West African gold explorer and developer focused on establishing a new mining district in Burkina Faso. Sarama owns a 100% interest in the South Houndé Project(1) and neighbouring ThreeBee Project(2). The two project areas cover approximately 1,400km² of prospective greenstone terrane and are Sarama’s principal focus to advance towards mine development. The two projects host a significant inventory of free-milling material, suitable for processing by heap leaching or a conventional gold plant. It is anticipated that the South Houndé Project’s 2.1 Moz Au(3) inferred mineral resource will form the foundation for development. Recent exploration success at the adjoining ThreeBee Project demonstrates good potential to add to the historical estimate of mineral resources at the Bondi Deposit (0.3 Moz Au measured and indicated, 0.1 Moz inferred(4). The company has established a promising growth pipeline, with a third 100%-owned Koumandara Project, covering an area of approximately 600km² in the Banfora Belt. Sarama considers this area highly prospective and early stage exploration has defined several corridors of gold anomalism that extend up to 40km in length. The company also holds a significant interest in the 0.67 Moz Au(5) Karankasso Project JV which is proximal to the South Houndé Project and remains part of Sarama’s regional portfolio mix. 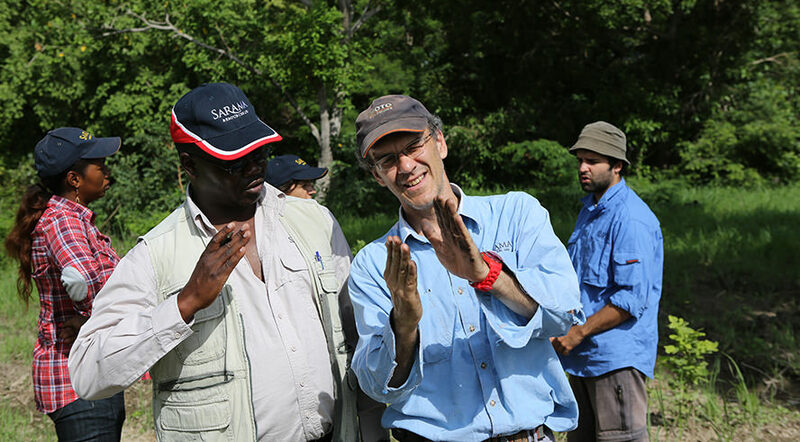 Sarama’s Board and management team have a proven track record in Africa and a strong history in the discovery and development of large-scale gold deposits. The Company is well positioned to build on its current success with a sound exploration and project development strategy across its property portfolio. (2) The ThreeBee Project comprises the Djarkadougou, Botoro, Bamako(5) and Bouni(5) Properties and Sarama has, or is entitled to have, a 100% interest in each of the properties. The Djarkadougou, Bamako and Bouni Exploration Permits are going through a process with the government of Burkina Faso where it is required they be reissued as a new full-term exploration permit. The Company anticipates this to be completed in due course, though there can be no assurance that the process will be successfully completed on a timely basis, or at all. (3) South Houndé Project – 43.0Mt @ 1.5g/t Au (reported above cut-off grades ranging 0.3-2.2g/t Au, reflecting the mining methods and processing flowsheets assumed to assess the likelihood of the inferred mineral resources having reasonable prospects for eventual economic extraction). This mineral resource contains an oxide and transition component of 16.0Mt @ 1.2g/t Au for 611koz Au (reported at a cut-off grade of 0.3g/t Au for oxide and 0.8g/t Au for transition material). The effective date of the Company’s inferred mineral resource estimate is February 4, 2016. For further information regarding the mineral resource estimate please refer to the technical report titled “NI 43-101 Independent Technical Report South Houndé Project Update, Bougouriba and Ioba Provinces, Burkina Faso”, dated March 31, 2016 and prepared by Adrian Shepherd. Adrian Shepherd is an employee of Cube Consulting Pty Ltd and is considered to be independent of Sarama. The technical report is available under Sarama’s profile on SEDAR at www.sedar.com. (4) Bondi Deposit – 4.1Mt @ 2.1g/t Au for 282,000oz Au (measured and indicated) and 2.5Mt @ 1.8g/t Au for 149,700oz Au (inferred), reported at a 0.5 g/t Au cut-off. (5) Karankasso Project – 9.2Mt @ 2.3g/t Au (at a 0.5g/t Au cut-off). The effective date (“Effective Date”) of the most recent Karankasso Project JV mineral resource estimate that is supported by a technical report is October 7, 2015. For further information regarding that mineral resource estimate please refer to the technical report titled “Technical Report and Resource Estimate on the Karankasso Project, Burkina Faso”, dated October 7, 2015 and prepared by Eugene Puritch and Antoine Yassa. Eugene Puritch and Antoine Yassa are employees of P&E Mining Consultants Inc. and are considered to be independent of Savary and Sarama. The technical report is available under Savary’s profile on SEDAR at www.sedar.com. Sarama has not independently verified Savary’s mineral resource estimate and takes no responsibility for its accuracy. Savary is the operator of the Karankasso Project JV and Sarama is relying on their Qualified Persons’ assurance of the validity of the mineral resource estimate. Additional technical work has been undertaken on the Karankasso Project since the Effective Date, including but not limited to, metallurgical testwork, exploration drilling and mineral resource estimation, but Sarama is not in a position to quantify the impact of this additional work on the mineral resource estimate referred to above.